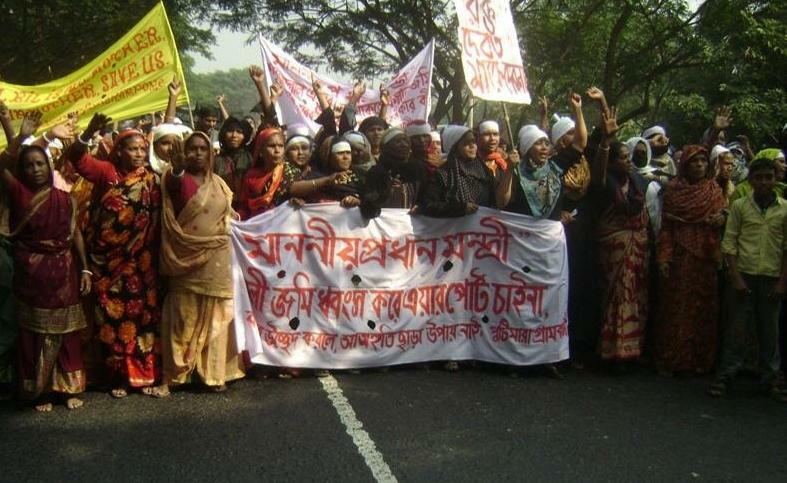 This is the first of the two part series on the debate in Bangla blogosphere over the protests against the proposed international airport at Arial Beel, a low-lying vast wetland in the middle of Bangladesh. In August 2010, the government of Bangladesh endorsed an ambitious infrastructure project, namely the construction of a new, modern, world-class International airport. A Public-Private Partnership (PPP) venture, the initial cost of the project was estimated at Tk. 500 billion. The land required for the project was estimated to be around 6000 acres. A beel at Tangail. Image by P. K. Niyogi. Courtesy Wikimedia. Initially, three possible sites were explored — two in Madhupur of Tangail and one in Mymensingh’s Trishal — with Trishal emerging as the favorable choice. However, on realising that in Trishal the task would be to displace/relocate a large number of people, the government, fearing resistance, changed its mind and without conducting any sort of feasibility study or environment impact assessment, earmarked the low-lying vast wetland Arial Beel (currently the 3rd largest beel in Bangladesh which stretches across parts of Sreenagar of Munshiganj, and Dohar and Nawabganj of Dhaka) situated 6km south of Dhaka city, as its chosen location. Interestingly, by then the proposed project had grown from an airport to include a satellite city as well, bringing up the land requirement from the erstwhile 6000 acres to 25000 acres. (See some pictures of Areal Beel by Lonely Traveler). No sooner had the project been announced, heated debates erupted among citizens in those localities. Many feared displacement and offered stiff resistance to the government’s decision and willingness to sacrifice the wetlands in its quest to build a shining new airport and city. 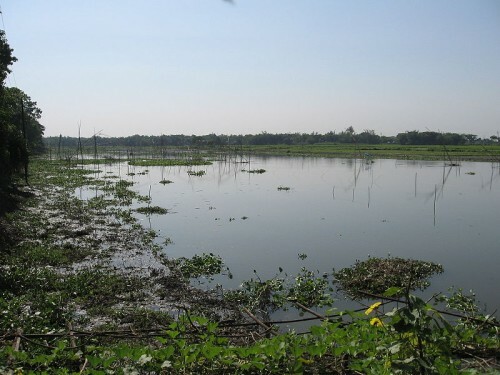 Environmental activists pointed out that the move to erase the wetlands would severely impact both environment as well as livlihoods of the local people living in the beel area. There were concerns that the government had finalised the location based on land survey records that were over 100 years old, without taking into account a) the changes that have come about over time in terms of habitations, land usage and overall terrain of the land and b) the critical role played by wetlands in recharging the groundwater resources. However, there were others who welcomed the initiative, hoping that the project will usher in employment opportunities and overall development of the area concerned. Apart from local residents, there was also excitement about the project among a section of non-resident Bangladeshis. After all, the project promised a world-class airport and city, an IT hub, a textile hub and many other such initiatives and a new expressway and monorail system that would connect the airport with Dhaka city. The Minister of Urban Development, Mr. Abdul Mannan Khan claimed that once the project was underway, the current legal landowners would get 5-10 kathas of land in the project area which would then be as valuable as a diamond mine – much higher than its current yield value. He stated that the people could not even imagine how their standard of living would leapfrog once the project materialised. Protests against the proposed international airport at Arial Beel. Image courtesy www.move4world.com. Click on the image for more. Both groups (for and against the proposed project on Arial Beel) began to get organised. Soon however, the issue got politicised, with the leading opposition party, the BNP, joining hands with the protesters and raising the volume of the protests and agitations to thwart the proposed land acquisition. The unrest soon spread and when the government tried to use the police force to control the protests, violence erupted in the area which left 1 policeman dead and over 100 injured. The protection versus land acquisition debate quickly spread online and fuelled the blogosphere. Bloggers reacted to various points associated with the issue. For those OPPOSING the project, their arguments were mainly two-fold: a) the ecological importance of preserving the Arial Beel and b) questioning whether a new airport was indeed required at this time. In this post, we look at the ecological arguments advanced by bloggers in voicing their opposition to the project. In the International Conference on the Commons at IASC 2011 in Hyderabad, India, a global community came together to reaffirm the importance of conserving and protecting the world’s water resources. Their concerns were reflected among the Bangla bloggers who put forth strong arguments for protecting the Arial Beel. As it is, climate change and haphazard construction of large dams have brought our waterbodies and wetlands to the brink of extinction. On top of that if instances of such unwarranted land acquision goes on then wetlands such as Arial beel, which is rich in biodiversity and the natural breeding ground of varieties of small fish, will be lost forever. মাননীয় প্রধান মন্ত্রী…আপনার পরিকল্পনা কমিটির কেউ কি জানেন না যে বিলটি প্রতিবছর বন্যায় ১৫-২৫ ফুট পানিতে তলিয়ে যায় এবং এই এলাকার মাটিতে পিট কয়লার গভীর স্তর আছে যা বিমান বন্দর সহ যেকোন ভারী স্থাপনার জন্যেই হুমকিস্বরুপ? The Arial Beel is a boon for agriculture. There is no scarcity of water for irrigation here. The entire Beel area has many large waterbodies which supply water to the fields all the year round. The excitement of a good yield is ever visible among farmers here. Arial Beel is a symbol of the agrarian Bangladesh. We do not want a development that converts our greens into reds. We want more greens (agriculture, reviving of abundant natural resources). We do not want to hide our earth with slabs of marble. This is not wasteland. This is not empty land. On this land there is an unparalleled confluence of effort and rich yields, of sustainable livlihoods. Many other bloggers too are discussing how the government could bulldoze over their own National Water Policy, opining that this shows that the government is not serious about conservation and protection. This post concludes in another part. To read more about the ‘Airport versus Arial Beel’ online debate, please look out for part 2 of this series, coming soon. Note: First published in Global Voices. Without detail feasibility study and EnvironmentalImpact Assessment it was unwise to emabrk on land acquisition for a mega project like Bangabandhu International Airport at Arial Beel.We do not understand why a democratic popular government takes such immature initiative which creates controversy. We do agree with the author here that leaving apart the debate on whether or not Bangladesh require a separate international airport now on top of three existing at Dhaka , Chittagong and Sylhet the debate on environmental issues has enough merit. No large project in Bangladesh is initiated without EIA. Then how land aquisition initiave could proceed at Arial Beel? Who were so enthuthiast?Why Government was to be embarrassed? Arial Beel can not be the ideal place for it. Bangladeshi rivers and waterways are alkmost dying fotr agressions of land grabbers . This is causing tremendous impacts on our environment. While government is endeavoring to recover canals, waterways and is working on massive river dredging initaives then what prompted them in initaing a massive infrastructure project in Arail beel? People suggresting this must have ulterior notice.The name of Bangabandhu has been attached unnecessarily to create further controversy. People of Arial Beel and environmentalists have genuine concern .PM Hasina took right decision to srap the plan.There is no big hurry. A proper location for the Airport must be selected after conducting deatil feasibility study and EIA. [EIA} it was unwise to embark on land acquisition for a mega project like Bangabandhu International Airport at Arial Beel.We do not understand why a democratic popular government takes such immature initiative which creates controversy. We do agree with the author here that leaving apart the debate on whether or not Bangladesh require a separate international airport now on top of three existing at Dhaka , Chittagong and Sylhet the debate on environmental issues has enough merit. No large project in Bangladesh is initiated without EIA. Then how land aquisition initiave could proceed at Arial Beel? Who were so enthuthiast?Why Government was made to be embarrassed? Arial Beel can not be the ideal place for iteven if it is on an axis of east werst travelling air route. Rivers and waterways are life lines of Bangladesh. Most of the Bangladeshi rivers and waterways are almost dying for agressions of land grabbers . This is causing tremendous impacts on our environment. While government is endeavoring to recover canals, waterways and is working on massive river dredging initaives then what prompted them in initaing a massive infrastructure project in Arail beel? .One must appreciate that Airports at Dubai, Singapore , Kualalampoor and Bangkok are playing major role in their economic grwoth.Qatar is expanding its international airport at Doha spending a billion US Dollars. It is not necessary that it has to be built adjacent to Dhaka . A properly constituted experts commitee having representatives of engineers, Econmomists, Environmentalists, Air Traffic Controllers , Aviation Experts may be entrusted to select proper location for the Airport and new township. Who on earth had advised the honorable PM of building an airport on a natural reserve that sustains both humans and wildlife alike? It seems that there’s only one person who is sensible and keeps track of people’s pulse. Its no one other than the PM. She deserves credit for abandoning the project as soon as she had come back from her trip abroad. She acted promptly. The opposition tried to create anarchy by exploiting the situation. The opposition’s role was irresponsible and callous. Khaleda Zia’s intellect is so shallow that she tried to draw a comparison between the Arial Beel situation and the recent developments in the Arab world. Does she understand that she herself is a product of a similar revolution that overthrew despot Ershad in 1991. Our politicians ought to behave more responsibly and utter words more cautiously. Otherwise there’s always the danger of power usurpers hanging out on the fringes. Removing Mubarak has solidified the grip of the army on power for the short term. But Bangladesh’s situation is totally different. Democracy is in our blood and the army has always been booted out and democracy gradually but surely taking root here. Opportunists or unconstitutional power grabbers like Yunus or Abed backed by the army would not hesitate to grab such opportunities to stay in power for a year or two to accumulate more wealth from the donors’ taxpayers money until they are again forced to bow out. This is a remote possibility. And it must not happen because it will take us back another two decades into the past and usher in an era of unbridled corruption. In Bangladesh democracy is deep rooted and the country came to being after its founding father’s party the Awami League won a landslide victory in 1970. Parliamentary democracy is evolving smoothly which is evident in the healthy functioning of it where ruling party ministers and MPs are also subjected to rebuke for their failures.This was not at all visible in the last parliament run by the BNP-Jamaat alliance of war criminals. Its a pity that BNP is outside the parliament trying to derail our democratic progress while the MPs are drawing salaries and enjoying all the privileges.